Our Gardenia Tealight Candles feature a clear plastic cup and are designed to provide beautiful bright light in all traditional tea light candle holders. Made in the USA with natural and essential oils, and a clean burning natural fiber single lead free wick - completely non toxic! 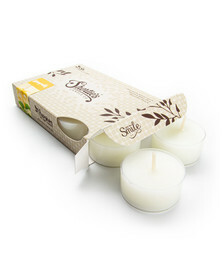 Our Gardenia Tea lights are hand poured with our classic food grade natural paraffin wax blend for great scent throw. All of our Floral tealights are highly scented and designed to burn all the way to the edge and bottom with a good scent throw. Each pack contains 6 Tea Light Candles 1.5 inches in diameter, each with 1/2 Oz. of wax, and burn for approximately 5 hours per tea-light. The Gardenia fragrance oil used in our scented candles and wax melts is Phthalate Free. Drift through this never ending Gardenia garden of dark green leaves and brilliant white petals that smell ever so sweet and intensely fragrant. Made with gardenia essential oils. 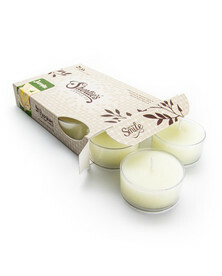 Our Gardenia tealight candles feature a beautiful clear container that allows the candle color to shine through brilliantly, and a self trimming natural fiber wick. Our Floral tea lights will add a luminous splash of color to any home decor, or any event big or small! Each 1/2 Oz. tealight burns for 5+ hours, and pack a great scent throw for such a small package. Our classic container wax is composed of a super soft paraffin petrolatum blend, which allows us to add up to more fragrance to each candle than traditional candles without the fragrance bleeding out. 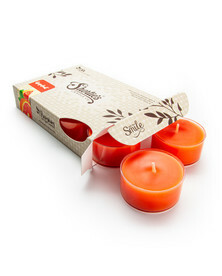 Our classic wax blend also features a low melting point making for a faster melt and better scent throw. There are not currently any reviews on this product. Have you tried it? Join our community and leave a review!